This entry was posted in Broadcasting, Editors' pick, Mobile, Multimedia and tagged BBC, British Broadcasting Corporation, correspondent, Internet blog, mobile reporter, mobile technology, reporter, Rory Cellan-Jones on June 12, 2009 by Judith Townend. Last week Journalism.co.uk reported on the BBC’s stance on social media use – in particular of Twitter – by its journalists; and the sometimes blurry divide between personal and professional use. Writing on the BBC Internet Blog, Roo Reynolds, portfolio executive for social media, BBC Vision, details discussions within the corporation last week about microblogging and editorial policy. – “[D]on’t say anything you wouldn’t say on air” – via technology correspondent Rory Cellan-Jones (@ruskin147). This entry was posted in Editors' pick, Social media and blogging and tagged BBC, correspondent, Internet blog, Journalism.co.uk, microblogging, portfolio executive for social media, Roo Reynolds, Rory Cellan-Jones, social media, Twitter on May 28, 2009 by Laura Oliver. 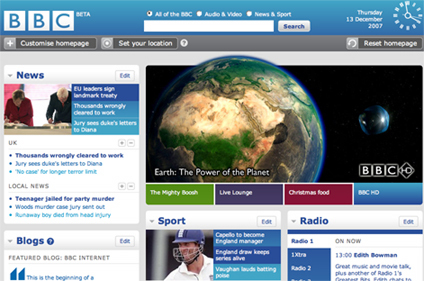 The BBC is to phase out the pop-up player that it currently uses to host the majority of its audio and video content in favour of a newly developed embedded Flash player. The new player has been developed jointly by the journalism and iPlayer teams, so says the BBC Internet blog, as a replacement for the pop-up which relies on using Real or Windows Media formatted video. Use of the new payer has so far been limited, but over the coming weeks embedded video is expected to become the norm. It’s hardly surprising, last year Pete Clifton, head of BBC News Interactive, talked to Journalism.co.uk about the experimental use of embedded players across the BBC News online. During that interview Clifton said that initial tests had shown up to a 40 per cent conversion rate, where people reading stories were also watching the embedded video. In its standalone player format, he added, the conversion rate was about two per cent. Channel 4 News found about the same. But he also touched on a another significant point; video embedded into stories, he added, was proving to be popular with audiences as these videos tended to dispense with the traditional news ‘package’ format, instead just showing the footage necessary to enhance the text story sitting beneath the embedded player. Getting this right is as important as changing the technology to a more user-friendly approach. This entry was posted in Multimedia, Online Journalism and tagged BBC, BBC News Interactive, Digital video, embedded player, head, Internet blog, Journalism.co.uk, Microsoft Windows, Pete Clifton, player, sport, Video on March 14, 2008 by Oliver Luft. Today sees the first outing of a podcast from the BBC’s Internet Blog. As announced by BBC blogs editor Nick Reynolds, the 30-minute download on ‘BBC Blogs as accountability’ features reactions to reader’s comments and a report of the workings of BBC Backstage – the BBC’s developers network. This entry was posted in Online Journalism and tagged BBC, developers network, editor, Internet blog, Nick Reynolds on December 21, 2007 by Laura Oliver. For those who have not yet sneaked a peek, this is the beta version of the new BBC homepage (thanks to Richard Titus on the BBC Internet blog for the tip). The new page allows you to personalise and localise what you want to see. Most of your regular and favourite stuff from can be brought to the page so it’s easy to get at. The little widgets that all the content sits in are also moveable and adaptable, you can set the number and type of stories – for example – that you want to see in each news and blog section. It also has a nifty little clock and a whopping great ad left top (as always) promoting Auntie’s latest big thing. But you can’t import feeds from elsewhere into the page, all the content on display has to be BBC content rather than your favourite stuff from other sites and blogs. NYTimes.com’s personalisation feature remains tops in this regard (If only they could add a web mail widget, then we’d be laughing). The new Beeb page seems very much about making its content more accessible, rather than making the page a necessary ‘one-stop destination’. “From a conceptual point of view, the widgetization adopted by Facebook, iGoogle and netvibes weighed strongly on our initial thinking. “We wanted to build the foundation and DNA of the new site in line with the ongoing trend and evolution of the Internet towards dynamically generated and syndicable content through technologies like RSS, atom and xml. “This trend essentially abstracts the content from its presentation and distribution, atomizing content into a feed-based universe. Browsers, devices, etc therefore become lenses through which this content can be collected, tailored and consumed by the audience. This entry was posted in Handy tools and technology, Online Journalism and tagged BBC, Facebook, head of user, Internet blog, Richard Titus, web mail widget, XML on December 13, 2007 by Oliver Luft.